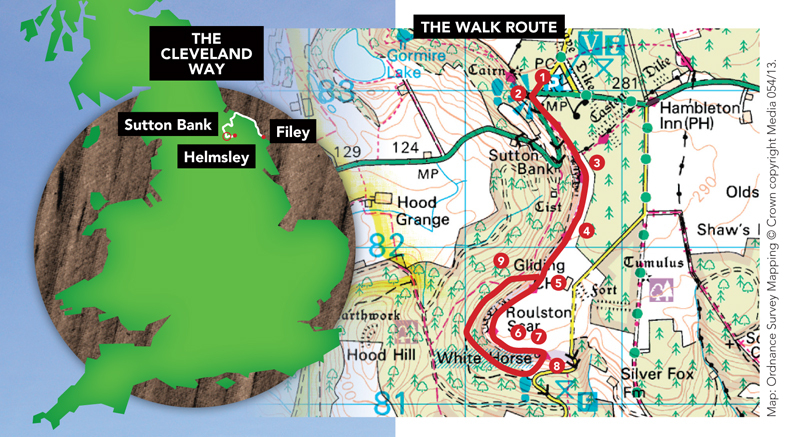 Michael Hallam headed to Sutton Bank, North Yorkshire, to walk part of the Cleveland Way. Michael was accompanied by Lisa Brooke, from Breadsall, Derbyshire, and her dogs, Jack Russell Terrier Jessica and Jack Russell Terrier X Border Terrier Alfie. Starting at the North York Moors National Park, Helmsley, the Cleveland Way weaves its way around the edge of the park to Saltburn-by-the-Sea before heading along the Yorkshire coastline to Filey. It stretches for 110 miles in total. From striding through moorland to discovering hidden fishing villages, the trail is rich in a variety of landscapes, history, and experiences. It opened in 1969 and is the second oldest National Trail after the Pennine Way. At the end of the route at Filey the trail meets the Yorkshire Wolds Way — another National Trail. Trail officer Malcolm Hodgson explained that the Cleveland Way was great for dog walkers. The Cleveland Way section on the National Trails website has a link to the Top 10 Trail Experiences on the route; visit www.top10trails.com. These 10 walks give some of the best experiences of the trail. Malcolm recommended sampling one of these walks. We decided to choose a circular route around the escarpment at Sutton Bank on the North York Moors. It has great views and offers the chance to see the famous White Horse hill figure, which is cut into the hillside at Kilburn. “This stretch is special because of its openness and superb views,” said Malcolm. 1. Start at Sutton Bank visitor centre. Take the path to the left of the centre and head towards the main road through the outer car park. Cross the road; ensure your dog is on the lead as the road can get busy. 2. Take the path which forks to the left and continue along the edge of the bank, enjoying your first look at the stunning views. Follow the footpath along the escarpment keeping the trees on your left. The path is a good distance from the edge of the bank but it is a good idea to keep dogs on leads. There is plenty of opportunity to allow your dog off his lead later in the walk. On your right you will see a small plaque commemorating air servicemen who died in plane crashes in the area during the Second World War. 3. Continue on the path; you will soon reach a point where the trees on your left disappear and it becomes an open space. There is a path here which leads away from the bank, signposted Cleveland Way. Do not take this route but continue along the path following the signpost marked Cleveland Way and White Horse. 4. Continue to follow the path straight on towards the White Horse, one of the largest hill figures in Britain which was cut into the bank in 1857. The open space on your left is the Yorkshire Gliding Club. Do not take your dog on to the grassy area, as there might be gliders in action. As the weather was good on our visit, we enjoyed the magnificent sight of a glider being towed up into the sky — even the dogs stopped to watch. On your right you will pass an information board about artist J.M.W. Turner. He visited Sutton Bank in the 19th century and sketched the views that surround you. You can leave the path to get closer to the edge of the bank but ensure your dog is on the lead and under close control. 5. The path bends to the left for several hundred metres towards the White Horse hill figure. 6. As you approach the White Horse you will see a path on your left which has a sign for the gliding club cafe. If you have time, take a detour to visit the gliding club. Follow the path before joining the road. Walk along the road a short way until you see the club’s buildings, which can be accessed from the road. Make your way to the front of the main building where you will find a viewing area with benches. Visitors are welcome inside the building to use the upstairs cafe or toilets on the ground floor. However, dogs aren’t allowed inside the building. Once you’ve enjoyed seeing the gliders at close quarters retrace your steps back to the White Horse. 7. You can enjoy a unique view of the White Horse landmark. During the Second World War, the figure had to be covered up to prevent enemy forces using it as a navigational marker. Most of the views on this route stretch for miles and seeing the White Horse close up is impressive — you get a sense of the scale of the hill figure and the work that went into creating it. There is a sign giving details of the history of the horse and why it was built. Visitors are not allowed to walk on the figure to help protect it from erosion. 8. Take the steps that lead to the woods. Take care as they are very steep — it might be easier to carry small dogs. Once at the bottom, enter the car park and turn right. Walk through the car park and towards a track between the trees. On your left you will see a open grassy area — a great spot to let your dog off lead. 9. As you take the track through the trees, this is another good opportunity to let your dog off the lead. Stay on the path as it slowly sweeps to the right. After about 900m you will see that you can either go straight on or take the path which veers to the right and goes uphill. Follow the uphill path on the right which will take you back to the top of the bank. You will emerge on the path opposite the gliding club. 10. 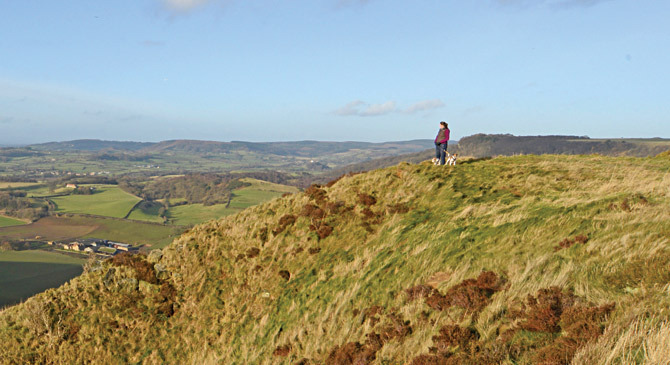 Retrace your steps along the path — enjoying the views once more — back to Sutton Bank visitor centre. Sutton Bank visitor centre, where the walk starts and finishes, has many facilities. There’s information about the walk and national park, plus activities and games for younger children. There is also a cafe. Although dogs are not allowed inside the centre, they are permitted in the entrance hall where there are two benches. There is plenty of outdoor seating too, so you can eat outside with your dog. The Yorkshire Gliding Club is certainly worth a visit. Former members of the club include famous aviator Amy Johnson who was the first woman to fly solo from Britain to Australia. It has a cafe which serves hot meals and snacks, plus toilet facilities. Dogs are not allowed inside the building but there is a viewing area outside with picnic benches where dog walkers can take a break. The Forresters Arms is a dog-friendly pub with accommodation in Kilburn. There is a charge of £10 per dog to stay. The village and pub can be reached by following the road at the bottom of the steps at the White Horse; doing this will add a couple of miles to the route. There is a car park at the bottom of the steps so it is possible to do the walk from here and visit the pub afterwards. The Hambleton Inn is located just outside the village of Hambleton, a short drive from Sutton Bank visitor centre. The pub welcomes well-behaved dogs, although it is recommended that you call before arriving. How to get there: Sutton Bank National Park visitor centre is situated on the A170 on the edge of the North York Moors. Terrain: The footpath is well maintained along the top of the bank. The track through the woods can get wet and muddy. Off-lead opportunities: Plenty in the woods but it is advisable to keep dogs on leads along the bank. Parking: There is ample parking at the visitor centre. It costs £4 to park for two hours or more. Toilets: There are public toilets at the visitor centre. Facilities are also available at the Yorkshire Gliding Club. 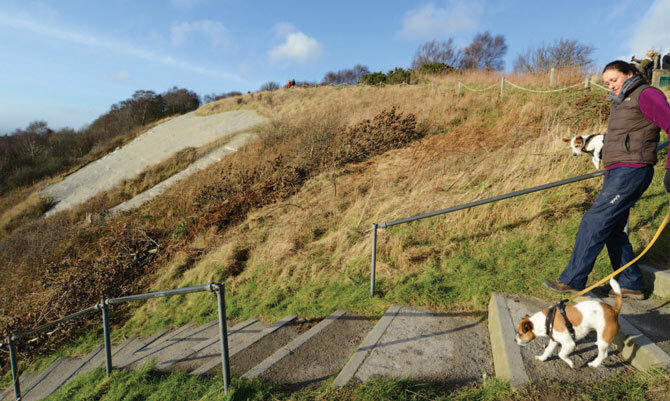 Suitable for: Reasonably fit dogs and owners as the climbs to and from the bank are quite steep.